It's been 12 months since I was involved in documenting this exciting cycling event and for some reason I've not written a blog post about it, so here it is now. Starting at Greenwich the cyclists gathered to unpack bikes, register, prep and meet their new cycling mates that would be with them for the next 24 hours. A quick brief was carried out by Sophie Radcliffe, aka Challenge Sophie, who would be leading the group to Paris and then off they went very excited leaving London behind. Unfortunately some didn't get far before the dreaded puncture! The support teams were very quick to help and get riders back in the saddle and on their way, time was counting down and a ferry wasn't going to wait! In the support car I got the chance to get a few tracking shots of Sophie as she sped through the countryside. Regular pit stops were a great way for riders to get to know each other and have a good laugh, as well as getting the essential snacks. These were a favourite amongst the riders and myself. And again a good time to sort out any issues with the bikes. Riders were all smiles and in high spirits as they passed or as I passed them in the support car. Check-in at the ferry, a quick 4-5hr crossing and a chance to rest the legs. Even after hardly any sleep the riders were all smiles and laughter as they filed off the ferry onto French soil. Sophie gathered them around for a quick chat, checked routes, supplies and was ready for what was going to be an unexpected very cold early morning ride! The French countryside looked beautiful as the sun came up giving the riders some lovely long roads. Breakfast was in a little french town that was still asleep when we arrived. The hot food and drinks went down a treat and was enjoyed in a small patch of sunlight that provided a bit of warmth from the early morning cold. As the sun got higher the temperature increased and turned into a glorious day for the riders and their cold hands. A quick pit stop, with a beautiful backdrop, allowed for a refuel, change into shorts, selfies and soak up some sun before hitting Paris. Arriving in Paris and at the Eiffel Tower brought smiles, laughter, tears of joy and celebrations from the riders. Trying to get a group shot was tricky with lots of tourists wanting to be in the picture as well, but managed to get one. Lucie is a sponsored free surfer and lovely to work with, even when the weather wasn't exactly tropical! Some of the shoot involved wearing a bikini and then running and splashing around in the slightly 'chilly' water, she was 100% committed and with a massive smile on her face as well, a true professional. More work can be seen on my site, link below. A great shoot with Andrew Henderson, Liv Cooke and Jamie Knight with Pro Direct London and Red Bull UK ahead of the Street Style competition in London. 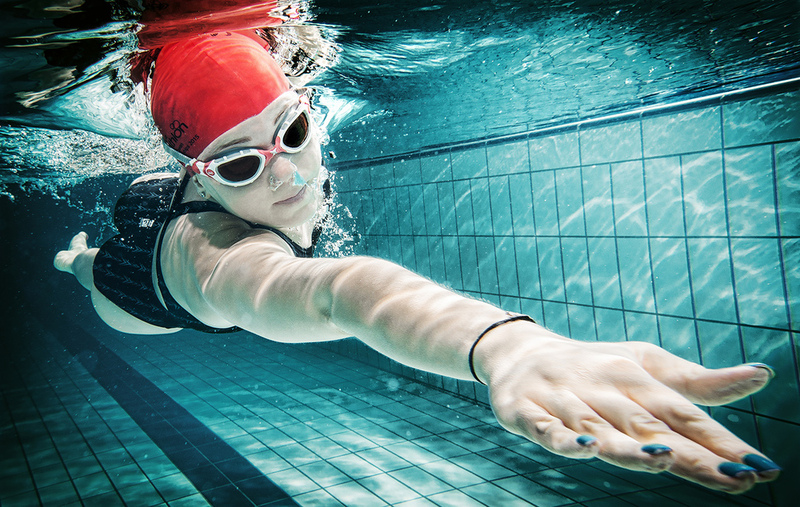 A great shoot with Triathlete Abi Schofield to capture some pictures of her training in the pool.